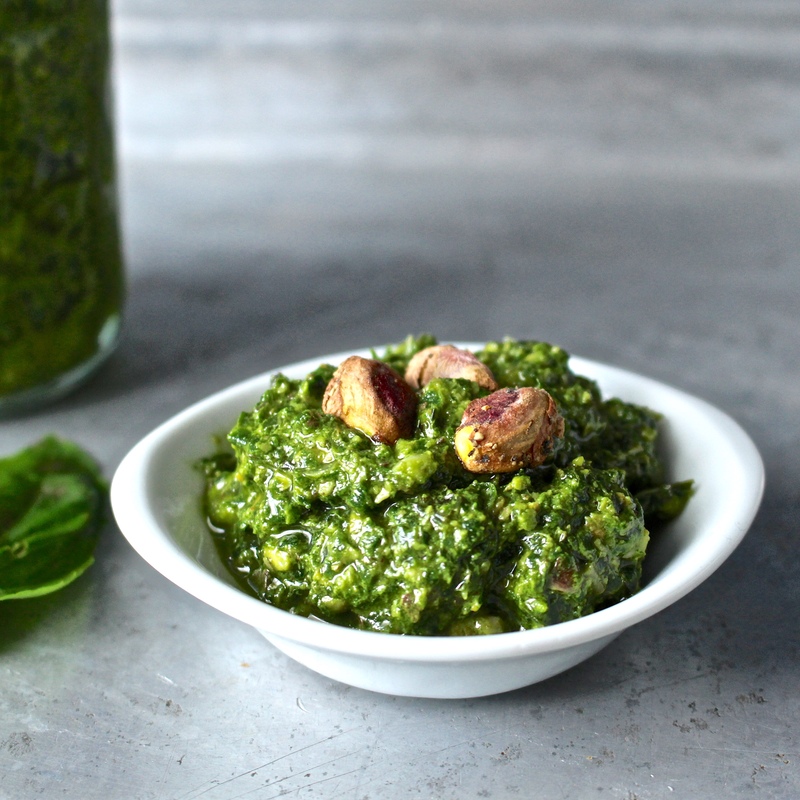 Paleo Pesto that is sure to liven up your spring dishes with its freshness. A few ingredients, less than 10 minutes and you have a delicious sauce. My husband loves pesto. It used to be a regular thing I bought to add to pastas, hummus, or chicken. Since the store-bought stuff uses cheap oil and cheese I knew I needed to make it myself. It is so simple and loaded with flavor. And bonus- also packed with veggies!! It has 3 cups of spinach in it, but the basil overpowers it. Not a spinach fan? Don’t worry, you can’t taste it! Pistachios were my nut of choice because they are a personal favorite. It all worked great together. I shelled them myself and it only takes a few minutes and costs so much less than buying them that way. One of the ways I used it was mixing it with a whole can of coconut cream (not coconut milk). 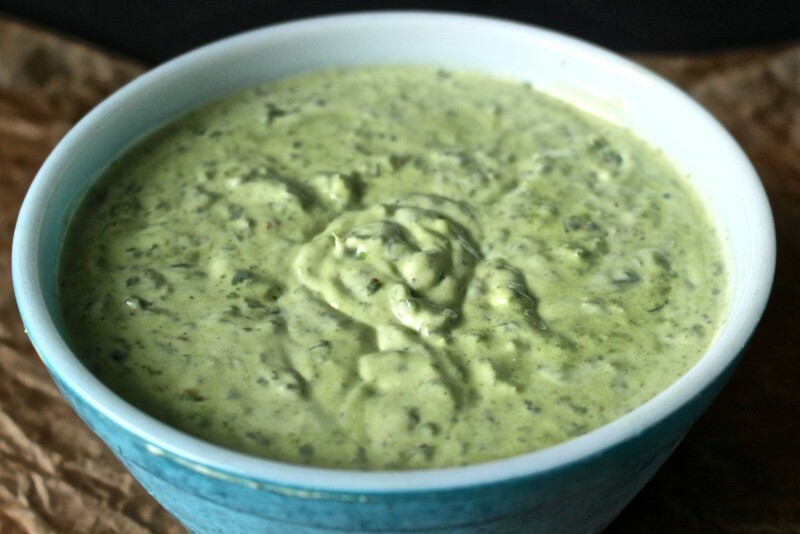 It makes a very thick and creamy dip that is perfect for veggies. It would also make a delicious chicken salad or would be perfect over a salad as a dressing. 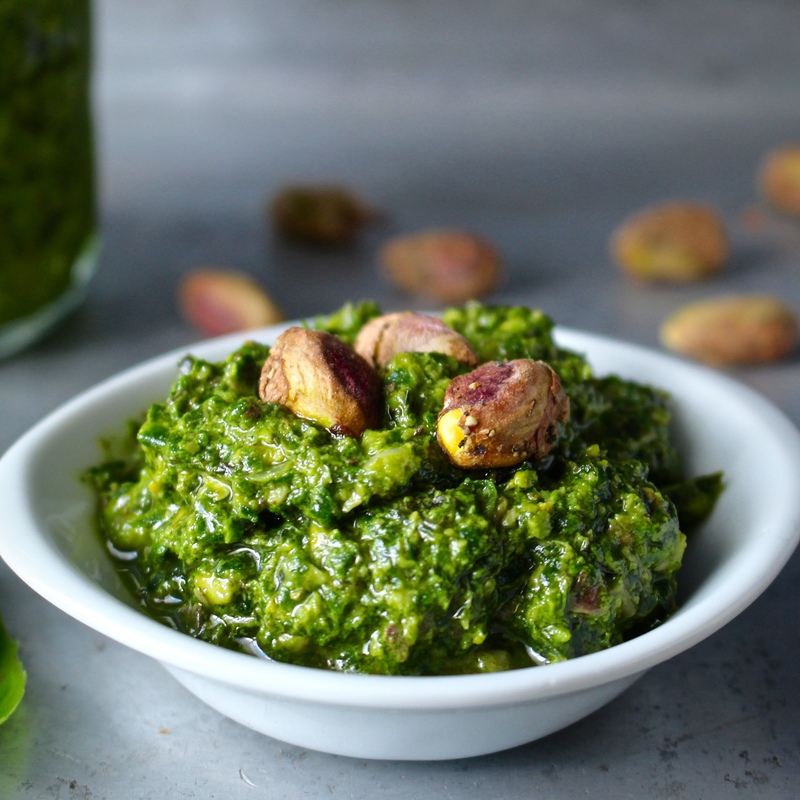 You won’t even miss the cheese with this flavorful pesto. I know it’s tempting to buy the store bought stuff, but this is not only cheaper, but also fresher and healthier. It’s Whole30 approved and even Vegan! This pesto is so quick and so versatile. You can use it in so many things! I can’t believe this is the first time I’ve made it homemade- It definitely won’t be the last! I made this with raw cashews (works great!) and added raw garlic because it needed “something”. I like it! Thanks for the recipe! You’re welcome- thanks for trying it!